My Mom's oldest brother passed away in Portland on July 17th. We live in Chicago. My Mom and her sister decided to have a memorial mass here since none of us attended the funeral out there. The two sisters had recently visited their ailing brother back in June. A little background: my Mother spent some time in the convent before she decided to marry Dad. My folks are regulars at daily mass at their parish, and Mom attends more than her share of funerals. She has told us that she has made notes (which she keeps in her nightstand drawer) to help us plan her funeral mass when the time comes. She's prepared - both spiritually and organizationally. 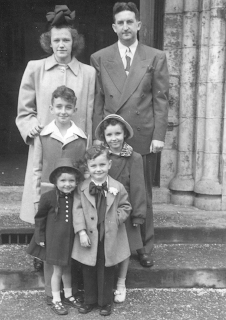 My favorite photo of Mom's family. Used in mass booklet. I have assisted her over the years in preparing mass booklets for funerals when a family member passes away. I know how to create a document, adjust the font size, select the correct paper size, use boldface, and scan photos to be utilized on the front and back cover. I am capable of emailing said document to a printer and giving detailed instructions for the type of paper, staples, and folding we require. These 'skills', as simple as they are, elevate me to some sort of super-hero computer user in Mom's eyes. Mom showed up at my house unannounced. It later became clear that she had TRIED to call. My landline had no dial tone, which made her think I was napping. No nap in the cards for me, and for the record- I don't ever mess with a dial tone in order to nap. I might close a door, or turn on a fan. I was unaware that my landline wasn't working because a wire that connected the main handset had recently come lose during construction. 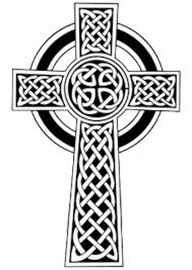 Mom was incredibly impressed that I could add a Celtic cross to one of the pages in the booklet. 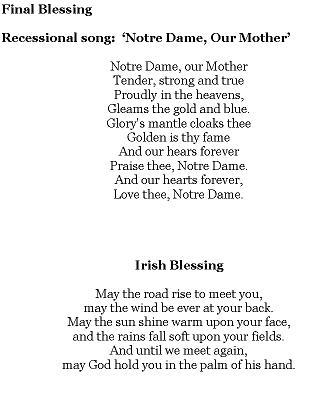 My uncle graduated from Notre Dame, thus the 'ND Our Mother' song. Mom, the least likely person to embrace technology in the universe, doesn't own a cell phone. She DOES however, know the phone number for mine. I don't understand why she hesitated to call it when my land line wasn't functioning. Ah, how handy it would've been if Mom had called my cell number to gauge whether or not I had time to help with the mass booklet. Kids filed in from school. 'Curly, once the junior high kids have had their snack they can play a rousing game of memory with you and Theo, since I can't now.' Curly was bummed. She is one of my few remaining offspring who enjoys my presence during things like Memory, snacks, and well . . . just about everything. When Ed walked in, I shared a look with him and he knew. 'I know my room is gross. I will handle it.' I had texted him my disgust while vacuuming. Lad texted to share that his latest tonsillitis symptom included a fever. Mom was sitting next to me witnessing what our after school routine is like. Mayhem. Pure mayhem. She was dealing with the interruptions and probably wishing she had come earlier during nap time when the house was quiet.